How can i redirect my readers to a typical part of the page? I dont know what its called in technical language, so i will try to explain by the actual example i m trying to do. I have got a page which would be glossary, where i would explain the terms generally used on site. Now, on some other page, i have a word which i want to link to glossary for easy understanding. though i can link it to the whole page, but that would be confusing, as the glossary may contain as much as 100 words n explanations. i want the same word to appear on screen in glossary which was clicked. Is it possible to do with synthasite? if yes, i would really appreciate if can give instructions about it. Thanks for all the support till now. I hope this helps until we can add this option to the link editor! Hey roxie, first of all very good concept. Good you put your efforts in some thing as nice as saving earth. I just wanted to ask, all the photos which you have used, do u own them? if yes, i would be really thankful if you can help me out with any place from where we get free images to use legally or get them with nominal fee. The site looks neat n clean, without unwanted clutter. A nice one. Monica.. Could I see your Website? I'm trying to do the same thing as Monica, similar at least? The best way I can explain it is to include a graphic. and added some HTML code above each picture. ?? What link do I now give eg. BUTTON # 2 to link to PIC # 2. Is it even possible to do what I an trying to do ? i think official help would serve you better. but i guess, you are trying something different (or atleast i could sense that from above post). You probably want to redirect visitors to a new page when they click a button. 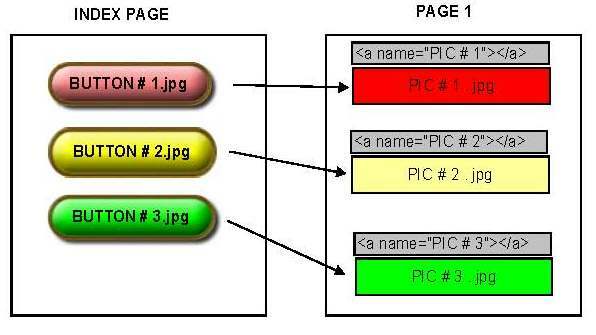 for that you need to make the respective pages, update your site n copy the links of the pages to respective images. Though i haven't tried anchoring links in synthasite yet, because i m still building my database..
What I'm trying to do is have only one visible page on my site - I will add a contact page later though. I'm trying to have as much info on my home page as possible. I do have a hidden page if you click on the top left button. I want to make this hidden page "long" , with many "anchor linked" pic's. with the reletive pic at the top of the page. Hard to explain, thats why I added the graphic. I wanted to start a new thread with this question, but I knew it had been discussed before and that Monique understood exactly what you were trying to do, thats why I joined this thread. Gimme your URL so I can see your site. It does not matter if it's still under construction, thats why we are all here. Does anyone know the maximum length a page can be anyway ?? Maybe I'm barking up the wrong tree. There's no maximum length for page, but please be aware, the longer the page is, the longer it will take to load. Adrian N roxie, wait for a day or two.. Managed to sort my problem out. Have not got all the buttons linked yet, only 1st three, but it looks like it's going to work. Thanks guys. Can't wait to see your site, Monica. Glad to hear you sorted your problem out Adrian.